On the 11th September 1939 the Ark Royal with six destroyers left Scapa Flow, for an exercise west of the Orkneys, HM ships Firedrake, Foxhound, Faulknor, Eskimo and two other tribal destroyers were to do Anti U-boat sweeps and to give protection to the Ark Royal. wandered if they would ever surface again, but pass it did, and later that night they surfaced to recharge there batteries and carried on with there patrol. Erwin Prügel was a sailor onboard U39 this is his story. Before leaving there base in Germany they were told that the torpedoes they had on board were experimental and on previous tests some had not exploded so adjustments had been made to the firing mechanism, they left port hopeful that the problem had been sorted out. On the 14th September at 15.12 hrs off the Rockall Bank U39 fired two torpedoes at the Ark Royal, Both exploded before hitting there mark. There were the three tribal class destroyers on the starboard side of the Ark Royal and Firedrake Foxhound and the Faulknor on the port side, Immediately HMS Foxhound picked up a contact on the ASDIC equipment, Bob Larner was the operator on watch, the position of the contact was reported to the skipper and signaled to the Firedrake and Faulknor who confirmed that position. Foxhound went strait into the attack followed by the Faulknor and then the Firedrake, all three destroyers dropped a pattern of depth charges over the same area, Firedrake was the last to lay her pattern, seconds later the U-boat came slowly to the surface the Ark Royal with Eskimo and the other two tribal class destroyers had by now raced away to safety, Foxhound was nearest to U39 as she surfaced and was about to ram her but men were seen jumping into the sea from the conning tower so the rescue started. 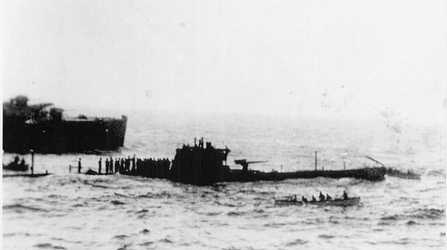 The Foxhound picked up 25 of the U-boat crew. The Firedrake picked up 8, the rest of the survivors were picked up by the Faulknor, all 43 of the crew were taken prisoner with only one of them having a slight injury, while the prisoners were being given dry cloths and hot food the U-boat sank, there was no time to board her, so there was no chance of getting any information about any other U-boats in the area. All the prisoners were transferred to the Foxhound so they could be landed at Kirkwall on the Orkneys the next day. On the Foxhound before the prisoners had been landed they were entertained by one of the prisoners who played an accordion lent to him by one of the crew of the Foxhound this helped to relax the prisoners, who had been told that if they were captured they would be treated very harshly. All the prisoners were treated very well, one of them on the Firedrake gave his autograph to Joe Curbishley an able seaman at the time, Joe survived the war as a Petty Officer and is still alive today and he still has that autograph. Photo left a British sailor onboard the Foxhound plays a tune on the accordion for the prisoner of U39 just before they were landed at Kirkwall on the Orkneys. Some time later it was decided that there wasn’t a secure enough place to put the U-boat men, so they were transferred to the mainland, they found them selves locked in the Tower of London for a time, but were soon moved a prison camp in Oldham and then later shipped to Lethbridge Canada to spend the rest of the war as lumber jacks. Erwin Prügel is alive today and has provided many of the photos, his daughter, Doris very kindly came to the HMS Firedrake Association memorial service for the Firedrake which was lost with the loss of 168 of her crew on the 17th December 1942. 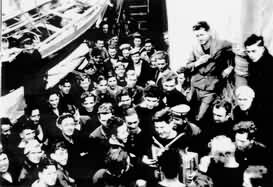 She laid a wreath for the crew and wished to thank the crews of all the destroyers involved for treating the prisoners of U39 so well. Photograph left is Erwin Prügel a sailor from U39 pictured with his niece in Germany, this photo was taken just before the war started in September 1939. Photograph right is Bob Larner who was the ASDIC operator that detected U39 after her failed attempt to sink the Ark Royal, later Bob was awarded the DSM for his action that day, Bob survived the war but has now has sadly pass on his photo was supplied by his son who is also called Robert (Bob) being the nick name. U39 was the first U-boat to be sunk in the second world war. Credited to the three destroyers Firedrake, Foxhound and Faulknor. 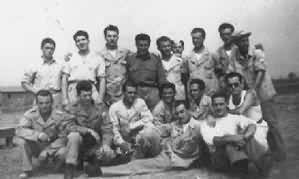 A photo of the crew of U39 taken just before leaving there base to go on which was to become there last patrol. 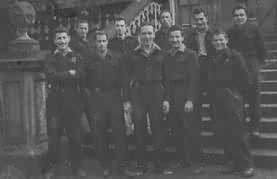 Left to right are: The famous Tower of London where Erwin Prügel and the rest of the crew from U39 sent some time before being sent to a prison camp in Oldham, later they were shipped to Canada there they spent the rest of the war as lumber jacks, Erwin Prügel is the tractor driver in in this picture, And thirdly the autograph of of one of the prisoners from U39 given to Joe Curbishley who was on the Firedrake. The two photos above were taken by Able Seaman Maurice Stevenson on board HMS Faulknor, the 8th flotilla's leader. He had joined the Navy as a boy at 16 and stayed in until 1950. 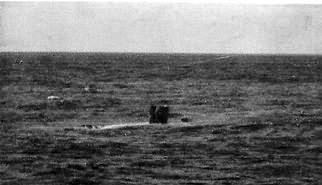 L/R this photo shows the damaged conning tower of U39 just above the waves, the second photo shows the Faulknor's lifeboat returning with some of the crew of U39, and HMS Foxhound in the background. The HMS Firedrake association would like to thank Gareth Smith, Maurices grandson for kindly sending us the photos. Left and right Erwin Prügel and Joe Curbishley today. A meeting after 63 years. In April 2002 Bob Lawrence 82 years of age, who was the Leading signalman aboard HMS Foxhound in September 1939, one of the destroyers involved in the detection and sinking of U39, the first U-boat to be sunk in World War II, visited Erwin Prügel at his home in Heimerdingen Germany. A Sunken U-boat Unites Them. There is nothing special about two men in their 80s sitting in their lounge and chatting about the past. However for Erwin Prügel from Heimerdingen and the Englishman Robert (Bob) Lawrence the situation is different. They had been enemies in W.W.II. Furthermore Bob Lawrence was the signalman on the British Destroyer Foxhound which was one of the destroyers that detected and depth charged the U39, sending her down to a 100 Mts. Marcus reports that Erwin who was 22 years old at the time and the rest of the crew had just about given up when the U-boat started to lift, the leading engineer had managed to blow the flooded diving tanks with the last of the compressed air. So the U-boat slowly surfaced and all the crew were rescued by the three destroyers taking them prisoner, seconds later U39 slipped under the waves for ever. 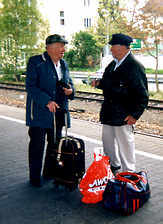 Bob (left) and Erwin (right) meeting for the first time in 63 years at the railway station. 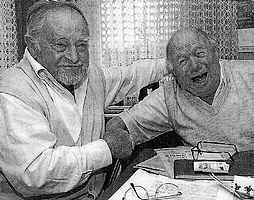 The photo on the right is the one printed by the local news paper, Both Erwin (left) and Bob (right) look as if they are enjoying themselves. 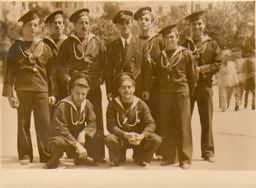 Here are two of the many war time photos that Bob took with him to Germany, the one on the left is some of the crew of U39 standing on the quay at Kirkwall in the Orkney islands, where they were landed before being taken to London, where they would be kept in the famous Tower of London till a place was found for them in the north of the country. Later they were transferred to Canada where they finished their captivity. 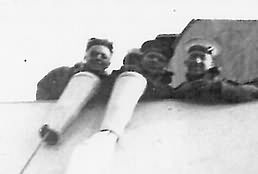 The photo on the right shows three sailors on the bridge of the Foxhound Bob Lawrence being the one in the middle. Vittorio Rappini R .T. 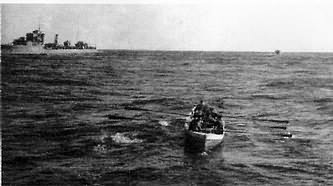 52358, was taken prisoner on the 18th October 1940 in the Mediterranean east of Gibraltar. Vittorio was an R.T. Rating on Italian submarine Durbo when she was spotted by two Saunders-Roe London flying Boats of 202 Squadron RAF, the destroyers HMS Wrestler and HMS Firedrake went strait into the attack with depth charges Durbo was forced to the surface, all the crew were take prisoner, and the Submarine sunk, there were no casualties they were landed at Gibraltar the same day. The Durbo’s crew were made comfortable and given dry clothes food and cigarettes. Vittorio remembers how kind and friendly the crew were to him. Soon they were transferred to the UK and then to a prison camp in America where he stayed till the war ended in 1945. While he was in the prison camp he learned to write and speak English. So after the war he worked with the U.N.R.R.A. The United Nations Relief and Rehabilitation program. He later emigrated to Canada where he died in August 1994. 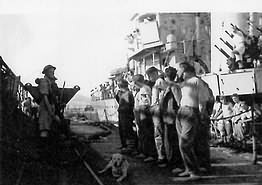 Photo Left: The crew of the Durbo being taken prisoner in October 1940. 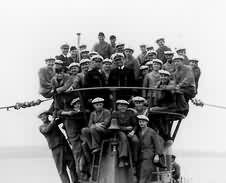 Photo Right: This Picture taken in May 1940 of some of the crew of the Durbo Vittorio is on the extreme right standing at the back. 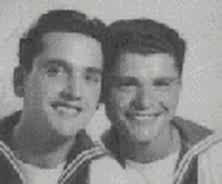 Antonio on the right and his friend Lorenzo Antonio Pisciotta was one of the last to leave the sinking submarine after being ordered by the captain to open the sea valves so the sub would not be taken into tow. Because he was not listed on the first list of prisoners he was listed as missing presumed killed in action and his parents receive a telegram to that effect, it wasn't till six months later that they received a letter from the red cross telling of his capture and that he was in a prison camp in Britain, later because of over crowding he was moved to a camp in the USA where the conditions were a lot better. Antonio had been in one of the prison camps in Scotland, Scotland in the winter is very cold and damp and with the added discomfort of being away from their families and shortage of food one of his comrades could not stand the conditions and committed suicide. After the war, Antonio return home to Italy in 1946. He felt that there were many opportunities in America and returned in 1951, settling in San Diego with his wife Rosalie and 3 children who later gave him three grandchildren. The Durbo prisoners in USA. 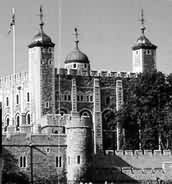 The Durbo prisoners in Scotland were kept at a castle, but the conditions were not good so were taken to the USA.